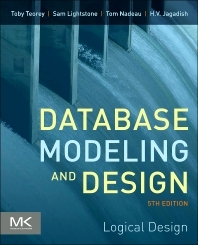 Database Modeling and Design, Fifth Edition, focuses on techniques for database design in relational database systems. This extensively revised fifth edition features clear explanations, lots of terrific examples and an illustrative case, and practical advice, with design rules that are applicable to any SQL-based system. The common examples are based on real-life experiences and have been thoroughly class-tested. This book is immediately useful to anyone tasked with the creation of data models for the integration of large-scale enterprise data. It is ideal for a stand-alone data management course focused on logical database design, or a supplement to an introductory text for introductory database management. H.V. Jagadish is a professor in EE and CS at the University of Michigan, Ann Arbor, where he is part of the database group affiliated with the bioinformatics program and the Center for Computational Medicine and Bioinformatics. Prior to joining the Michigan faculty, he spent over a decade at AT&T Bell Laboratories as a research scientist where he became head of the Database division.